When we were shooting the content for my book the lovely Holly Booth came down to stay and the evening before we spent the day in a studio shooting for the book she took some lovely shots of my studio. 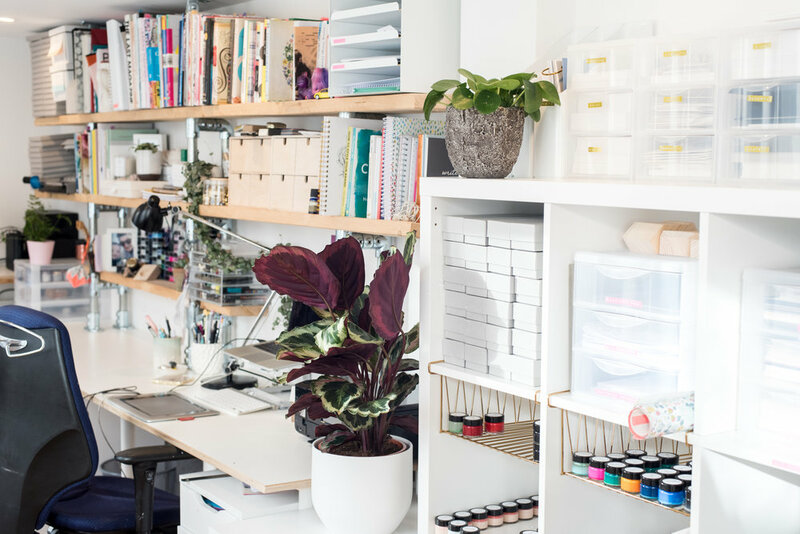 This studio is absolute chaos most of the time but it is my little oasis and I love working in here so it is really nice to have some pictures to share properly. 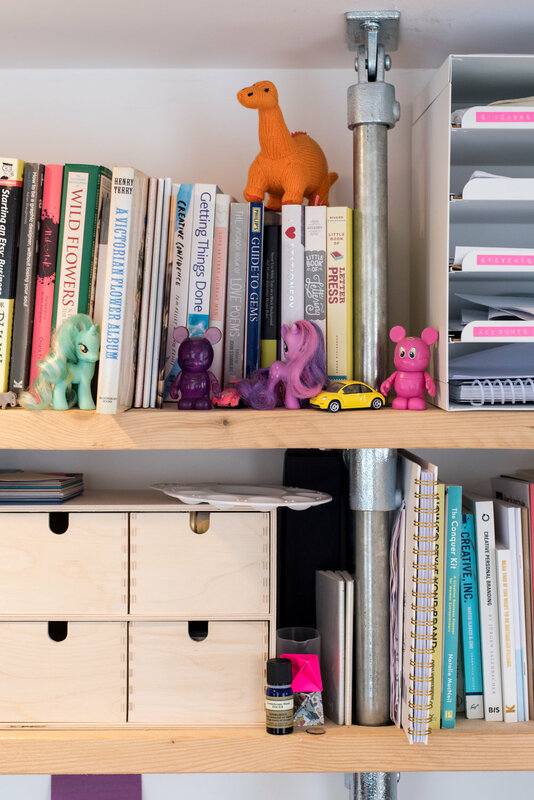 I am on a never-ending journey to find the best storage solutions as things tend to pile up but when it is tidy it is pretty manageable (until it gets untidy a couple of hours later!) and most things have a home until everything goes mental during wedding or christmas season! We built our studio about 4 years ago after Steve bought a letterpress on a bit of a whim and we suddenly had a huge half a tonne bit of kit to house. There was a shed here already which had foundations so we knocked it down (figuratively I had absolutely no part in the manual labour!) and built a long building which is half our studio and then the other half is a shed (/storage for my packaging materials!) and outside garden storage. It has definitely changed a bit over the past few years changing and adding different storage systems like above desk shelves and the ikea square shelves and it certainly isn’t perfect but it has always been my happy creative place. The desk is L shape (the long bit for me and the short bit for Steve/my overflow) which we built to fit and then there are Ikea Alex drawers and cupboards for storage underneath. The shelves above my desk we bought from here and Steve put together. The walls are not super strong (and I own A LOT of books) so we had to have something that was anchored to the ceiling and desk instead. In terms of on desk storage I have lots of pen pots and some acrylic drawers from Muji which keeps all my paint pens flat so they don’t dry out and some wooden drawers from Ikea to store all my paints and some extra inks. My rainbow of inks and all my books are kept on the shelves above the desk. The large storage unit which stores all my materials and samples is the Ikea Kallax and I have the added trays and drawers to add more storage for small items. I also have storage boxes in them and some plastic drawers from amazon to store all my paper samples which are a LIFESAVER. All in all it is pretty simple and as with everything a bit of a working progress, it is quite narrow so when I get lots of big items in like boxes of seaglass or baubles it can get a bit hectic…I am also incredibly messy (I know I KNOW hard to believe) so whilst a lot things have a home it does sometimes (okay VERY OFTEN) become a bit crazy but thanks to Holly I now have these photos to remind me of how it can look when it is spick and span! The plan is for this post to be short and sweet but if you saw my Instagram stories the other day (now highlighted under Copying) then you will know that short and sweet really isn't my jam but I will try I promise! I like to help people I really really do, it has been the most surprising part of setting up Oh Wonder - the teaching and mentoring of others who want to start calligraphy as a hobby or sometimes as a business is not something I expected and yet one of the most enjoyable parts. It is the reason I teach workshops and why I loved writing a book. I put pretty much every part of my knowledge into that book (I mean I had to to reach that many pages!) so I really really don't mind sharing knowledge. However I get a lot of messages asking me outright - where did you get this, where did you get that and a lot of the time it isn't even sweetened with a hello how are you?! and that kinda upsets me. Firstly because I spent A LOT of time researching materials and tools at the beginning and I still do. I do not have all the answers and sometimes I get a client come to me with a wild and amazing idea that I have no idea how to do, so I sit on my laptop and research everything I can and then I try a load of different pens or inks or whatever out until I find the answer, it is kinda part of the fun! And secondly a lot of the time these people have their own businesses doing the same thing that I do and it seems like they are just trying to copy me which hurts a lot because as anyone who is creative knows…our ideas, services and products are our babies. It is important to not think just because there is someone out there doing the thing that you want to you and you follow them on the internet, that you get to skip the trial and error stage of making something. I have only been outright copied once before (although there have been a couple of a bit close for comfort moments) and it was with my baubles. Someone started doing ceramic personalised baubles, which is annoying but fine - I do not own the idea, lots of people do them, but the kick in the teeth was that i spent AGES choosing colours and making mine different and she just went and did them in EXACTLY the same colours that I had. I mean come on. At least pick different colours. A friend of mine pointed them out to me and I knew that I had been following this person but suddenly I couldn't find her….oh because she blocked me. Funny that. Thankfully I have the most amazing industry friends who have my back and let me know about the copying. I then let her know (through my other secret squirrel Instagram account / the one where I post all the pics of my kid) I knew and whilst I had no way of really stopping her I hoped that she would rethink her offering in a way that made in unique. The thing we live in a world where EVERYTHING is on the internet. We are influenced by so many things (the gorgeous Zoe from The Golden Letter wrote an excellent post on this here) and it sometimes gets a bit foggy knowing where your inspiration came from, but there is a difference between using something as an inspiration and full on copying (and yes just changing the colour does still mean you copied it). It is important to sit back and ask yourself the question, do you really want your business to be a copy of someone elses? Or do you want to take things slowly, take a step back and go through the learning and exploration stage that we all did to create a unique business that fits you like a glove? I promise you the latter will bring you a lot more happiness, satisfaction and clients that are perfect for you. Failure is a funny one. It is something that we all feel and as humans who want to succeed at all we do it is natural to feel like a ‘failure’ when things don't go to plan. Four years ago I felt like a total failure. In every sense of the word. I couldn’t figure out how to go about doing what I wanted to do, failure. I wasn’t very happy, failure. I wasn’t doing anything to utilise the degree I had spent 3 years getting, failure…a degree in which I had only got a 2:2 in, failure. I had changed what I wanted to do with my life a million times, failure. I had spent all my savings, failure. You can see where I am going with this…basically I felt like a huge failure. Anyway…over the past couple of years running Oh Wonder has truly opened my eyes and given me a lot of perspective and I like to think some wisdom (LOL) on things like failure. Overall I no longer feel like one and I no longer feel like that list of things above are failures. They are lessons. Without all those things happening I would not be where I am today (literally sitting in a cabin on a pond after teaching in Wiltshire) and I wouldn't be the person that I am today. In September 2016 I was exhibiting at The Handmade Fair at Hampton Court. It was my first show, I was a total newbie, I had only been running Oh Wonder for 8 months and I went there selling letterpress cards, notecards and gift tags. I had spent WEEKS printing these all myself in various different colours - shipping the kiddo off for the weekend multiple times throughout the summer and spending two days solid printing/fighting with the letterpress. To say that I was stressed would be a slight understatement. I was kinda manic. There was stuff everywhere and we would spend the evening packaging up cards and tying bows around packs of notecards. That weekend was one of the worst weekends of my life. No lie. I spent so much money, not only on the stand but also on kitting the stand out and getting all these products ready and I took £200 the whole weekend. On the first day I took £30. And that ain’t profit. OVERALL TAKINGS. The rest of the money I took that weekend was from my FAMILY who all came and felt horrendously sorry for me so bought all my cards. I spent most of the weekend trying not to cry. Thankfully I was surrounded by wonderful women who kept me boosted up but inside I was devastated. The loss financially was HUGE to me at that point in my business and I spent the whole journey home each evening crying. All I felt was that this was a HUGE FAILURE and it knocked me for six. Flash forward a couple of months and I heard from Teach Us who were at the fair as well and had approached me about doing a workshop with them for charity. We arranged to get together and I did a calligraphy workshop for them in my lounge at home. It was so much fun and I really enjoyed it. Matts, one of the guys who runs Teach Us, girlfriend Meg worked for Brand Events the event company that runs The Handmade Fair and she then got in contact with me to see if I wanted to teach at The Handmade Fair at Ragley in May 2017. I would be an expert at the show and teaching an hour long workshop every day to up to 100 people. Yeh sure I said….panicking inwardly (You can read a bit more about my intense feelings of fear surrounding this event here) and my details were popped up on The Handmade Fairs website as an expert. AN EXPERT. A couple of weeks before the fair I got an email from a lady called Joanne. She works for a publishing house called Haynes and she wanted to talk to me about writing a book for them. I am going to go into more detail about this in a full post about my book process, but when I asked her how she had found me she said….wait for it….through The Handmade Fair. Fast forward to June 2018 when I am writing this post (although it wont be published until I have told ya’ll about my book so probably August time or the end of September ha!) and I am sat on the porch of an Air BnB having finished teaching at my second Handmade Fair of 2018, with one more to come in September, and my book - Modern Calligraphy and Hand Lettering went to print a few days ago. None of this would have happened if it wasn't for that ‘failure’ of a weekend in September 2016. Well it might of in the end but in this version of my life that is where it started. So that is why I (try to) no longer see things as failures. Yes it is still heart wrenchingly gutting when things go wrong (and trust me I still have pangs of disappointment when I think of that weekend) - especially when you lose a tonne of money - but I am trying to see them instead as lessons, and ways in which different doors open in life. You never know where your ‘failure’ is going to lead you…it might just end up taking you somewhere pretty amazing. 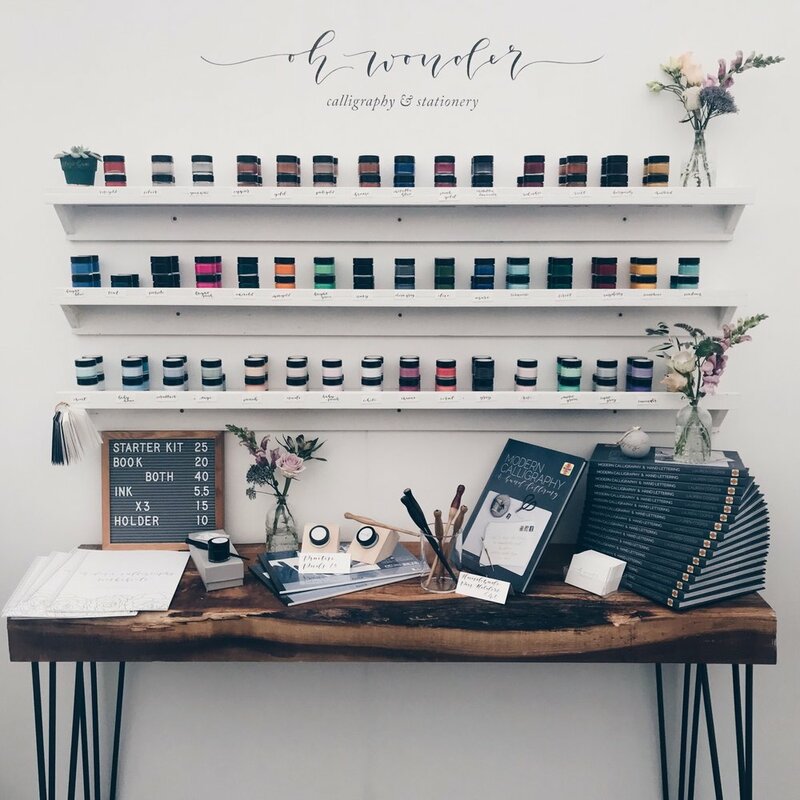 Edit - Between writing this post in June and posting it now I have exhibited again at The Handmade Fair at Hampton Court and I tripled what my goal for the weekend was. Well and truly kicked 2016 in the arse.